Safed's wonderful location in center of the north of Israel makes it a great jumping off point for day trips and excursions. If you are searching for ideas for things to do and places to visit in the area around Safed, then look no further. Check out our many suggestions for wonderful day trips that everyone can enjoy. If you are looking for an outdoor adventure then why not travel northward to the Hula Valley and visit the Hula Nature Reserve, a world famous destination for birders. For more outdoor fun, consider visiting Nahal Amud, Biriya Forest, or Ein Zeitim. For hikers, the 1,000-kilometer Israel National Trail, passes right by Tsfat in a forested valley just below. There are many other beautiful chioces for hikers, including the Zaki Hike near the Kinneret and the Ahziv Hike that's close to Maalot. 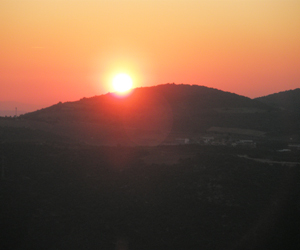 Check out additional hikes in the Galilee. Also, don't forget to make that summertime trip to the Kinneret (Sea of Galilee) for fantastic swim in one of the world's most historic bodies of water. Find out more about why these may be the perfect excursions for you and your family or check out the country's many nature reserves and Tel Hai. If you are looking for a more historical outing then why not visit the Talmudic Village at Katrin? Also visit Tiberius and walk along the historic city wall currently being uncovered by archeologists, as well as many other activities. Next, take a ride over to the archeological site of Hatzor and walk among the ruins of a city that existed during the First Temple Period. Don't forget to make a stop in the quaint town of Rosh Pinna where you can learn all about hardships of the 1st aliya and visit many local artist studios. While exploring the area why not visit the many gravesites of famous rabbis and see first hand the unique prayer culture that has developed around these graves. Lastly, don't forget to pay homage at the grave of Rabbi Bar Yochai and find out about the vastly popular lag b'omer celebrations that take place every year at his gravesite. Also check out some Christian sites while in the area. For trips that are more laidback and fun consider taking a wine tour and tasting at the Dalton Winery, Golan Winery or the Rimon Winery. For a little bit of pampering then give the Mitzpe HaYamin Spa a call and make an appointment for some special relaxing treatments. For a bit of rustic fun then why not pay a visit to the Bat Ya'ar Ranch? Lastly, if you are in the area during the Jacob's Ladder Music Festival then you shouldn't miss catching a few performances. Also take a look at our article on the Hamat Gader Springs.